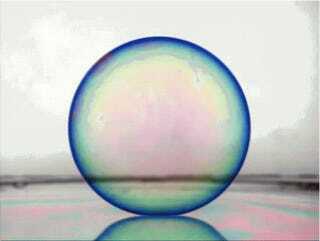 Have You Ever Seen a Soap Bubble Bounce? Fifteen years ago, researchers used high speed video to show that when a drop of water coalesces into a layer of the same liquid, it does so not instantaneously but in a matryoshka-like cascade, with each step generating a smaller drop. Now, a newly published study finds that soap bubbles do something similar. Bush and his colleagues write that they observed the progenitor—>daughter process repeat up to three times before the bubbles coalesced completely. When researchers first observed this phenomenon in ordinary water droplets (i.e. sans soap), they reported witnessing as many as six consecutive cascade events before the droplet coalesced completely. The highest number of events I’ve been able to find recorded on video is five (or maybe six, depending on how you count), though Bush has previously reported witnessing as many as seven in a row.